The good news is on a very short-term basis, the market IS INDEED bullishly biased and coming off an extremely strong first-quarter rally. 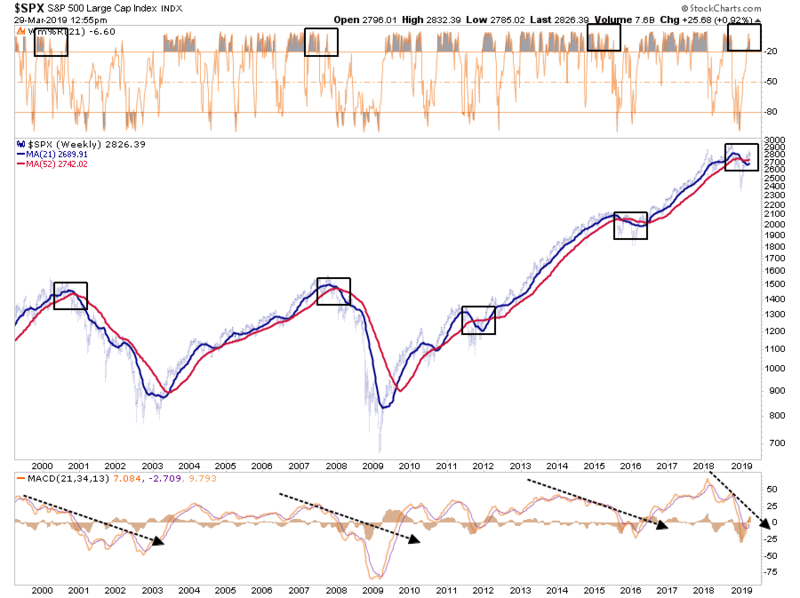 The current momentum of the market is strong as bullish optimism has regained a foothold. The peak-to-trough-to-peak cycle over the last year was measured in months not years as was the case before 2018. Nonetheless, the markets are close to registering a “golden cross.” This is some of that technical “voodoo” where the 50-day moving average (dma) crosses above the longer-term 200-dma. This “cross” provides substantial support for stocks at that level and limits downside risk to some degree in the short term. 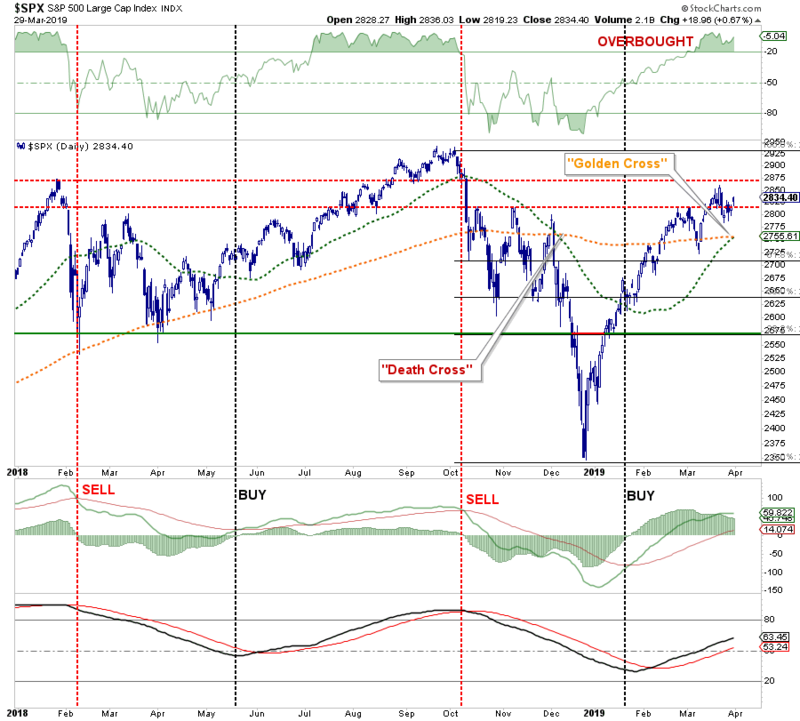 In the short term, the market remains bullishly biased and suggests, with a couple of months to go in the “seasonally strong” period of the year, that downside risk is somewhat limited. Are tactically positioned for a trade resolution (which we will sell into the occurrence of). 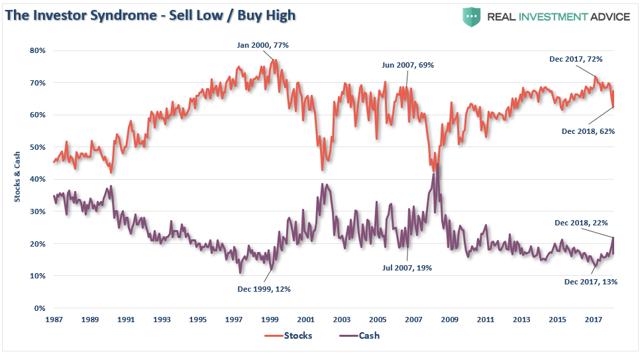 Since the majority of mainstream financial advice never suggest selling, investors had no clue that if they had gone to cash in 1998, they would have saved themselves both a lot of grief and years of losses needing to be recovered. 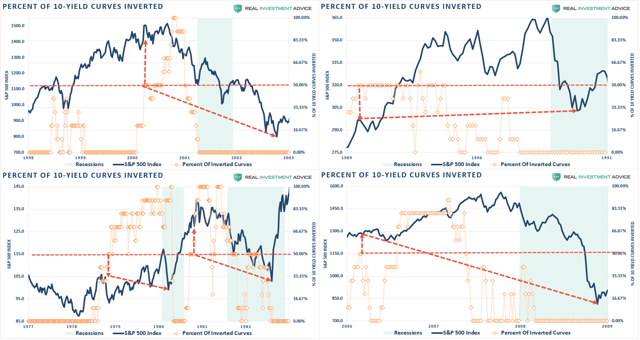 This quad-panel chart below shows the 4 previous periods where 50% of 10 different yield curves were inverted. 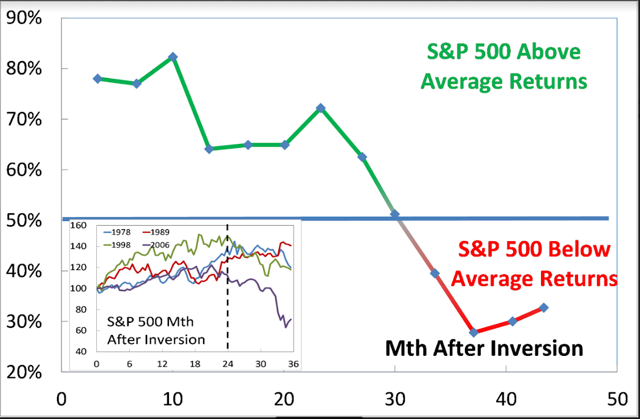 I have drawn a horizontal red dashed line from the first point where 50% of the 10-yield curves we track inverted. I have also denoted the point where you should have sold and the subsequent low. Oh, as we noted last week, we just hit the 50% mark of inversions on the 10 spreads we track. Investing isn’t a competition. It is simply a game of survival over the long term. 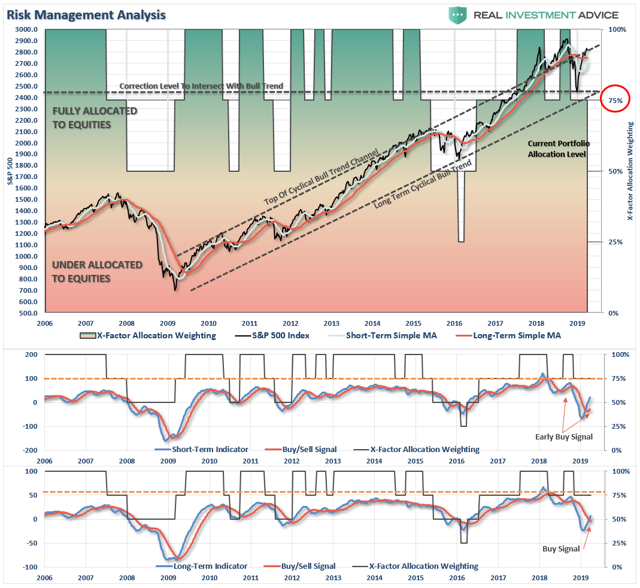 While it is critically important we grow wealth while markets are rising, it is NOT a requirement to obtain every last incremental bit of gain there is. Staying too long at the poker table is how you leave broke. 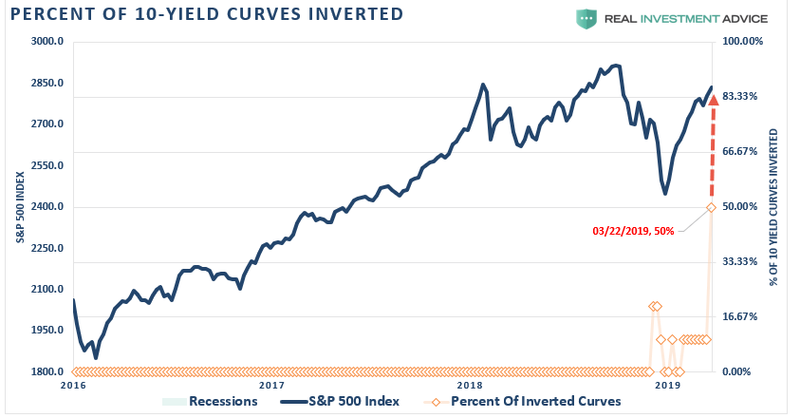 The yield curve is clearly sending a message which shouldn’t be ignored and it is a good bet that “risk-based” investors will likely act sooner rather than later. Of course, it is simply the contraction in liquidity that causes the decline which will eventually exacerbates the economic contraction. 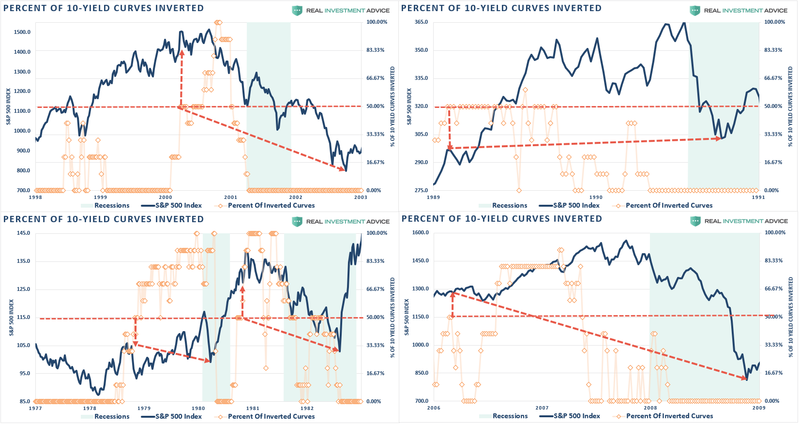 Importantly, since recessions are only identified in hindsight when current data is negatively revised in the future, it won’t become “obvious” the yield curve was sending the correct message until far too late to be useful. Looking at sectors on a “relative performance” basis to the S&P 500, we have seen some rotations in leadership over the last week. Energy began to improve its performance as oil prices perked back up last week. With oil back to the higher end of its trend range, this is likely a good time to harvest some profits from the sector. 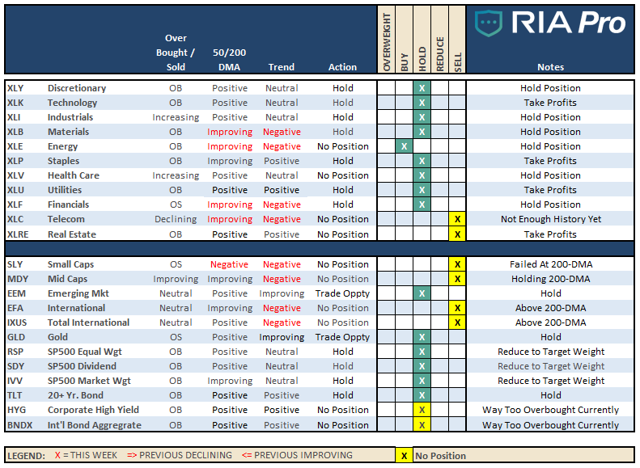 Discretionary particularly picked up performance last week and joined the small group of sectors where the 50-dma has crossed bullishly. Industrials also gained ground on continued hopes for a trade resolution with China. These sectors are all overbought, so take some profits, but remain long for now. Current Positions: [[XLI]], XLY, XLC, XLK – Stops moved from 50- to 200-dmas. 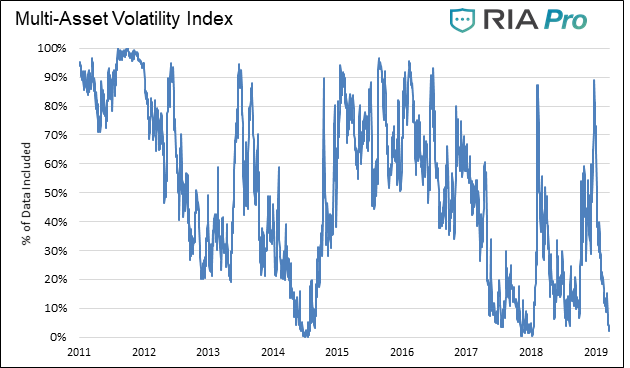 Lately, Utilities and Real Estate have been on a parabolic advance. Not surprisingly, they are taking a breather as money rotated to more offensive sectors last week. 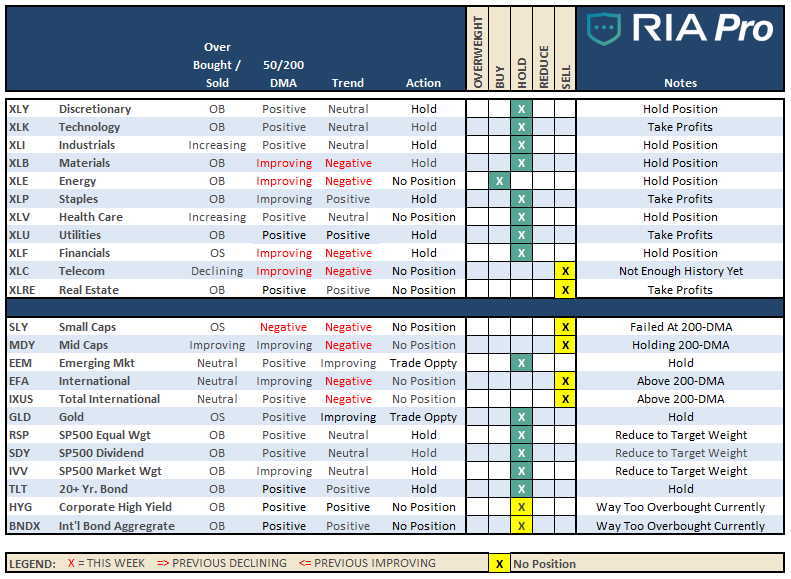 We have previously recommended taking profits in these sectors for now, which remains the advice again this week. Financials have been struggling as of late due to the inversion of the yield curve which impacts their profitability. 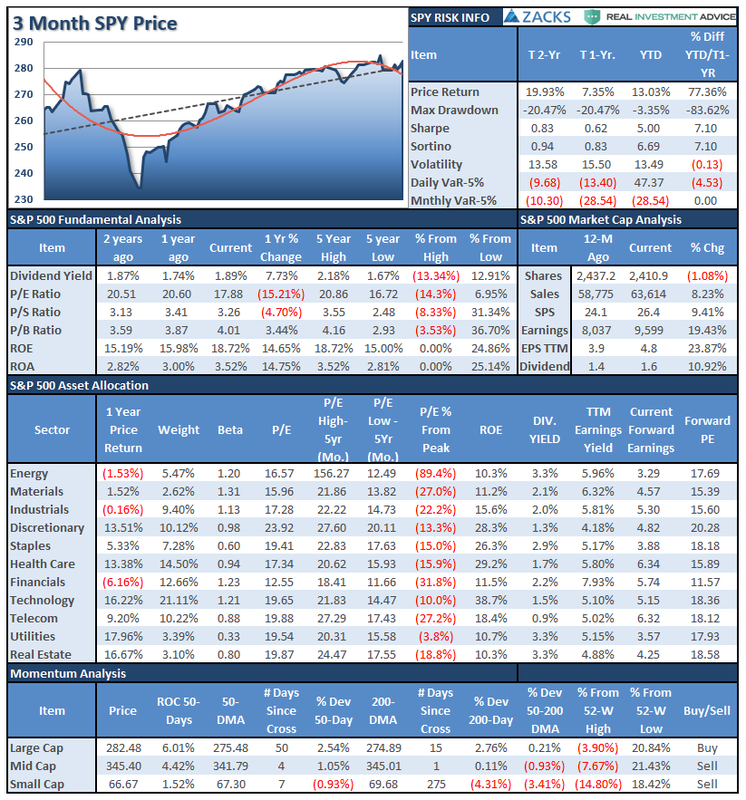 Healthcare and Staples also weakened a bit this past week as money rotated from defense to offense in the market. Take profits and reduce back to portfolio weight as needed. 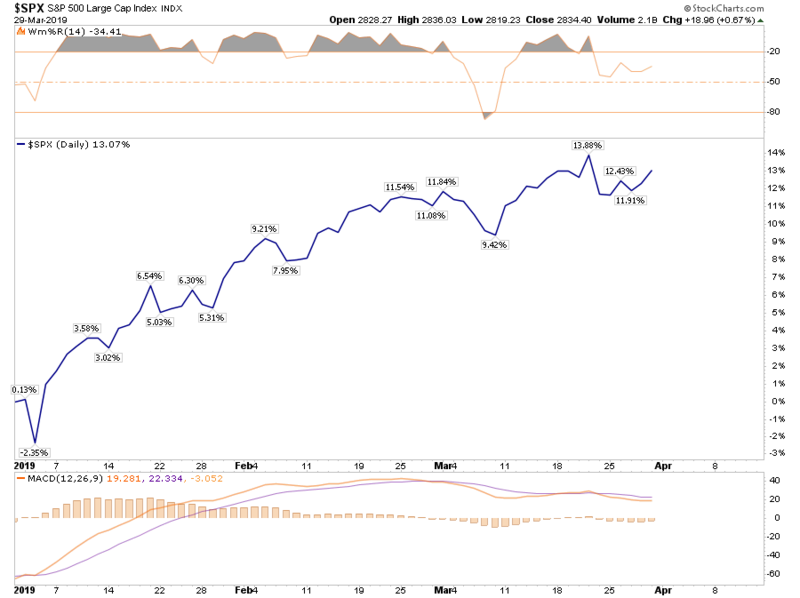 Current Positions: [[XLB]], XLF, XLV, XLP – Stops remain at 50-dmas. 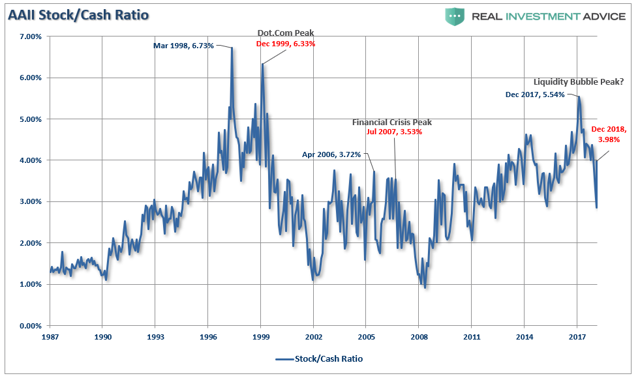 Small-Cap and Mid Cap – Both of these markets remain confined within the context of a broader downtrend. 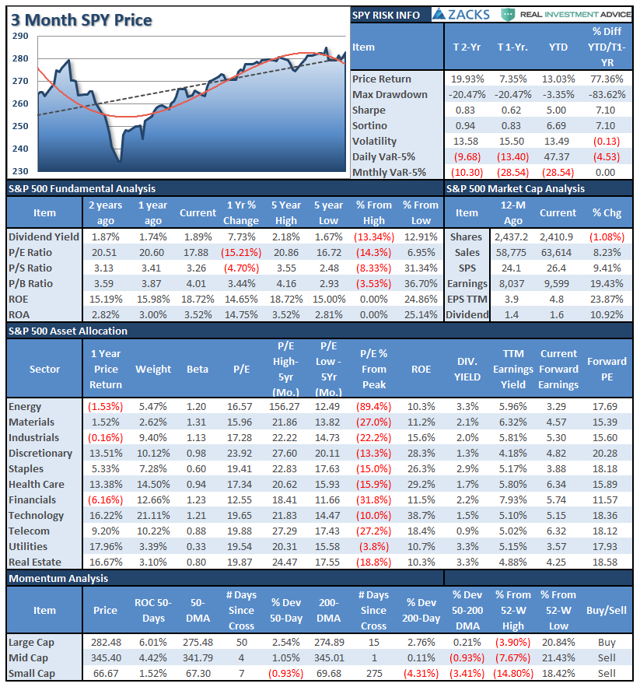 As we have noted over the last several weeks, these two sectors are more exposed to global economic weakness than their large-cap brethren so caution is advised. 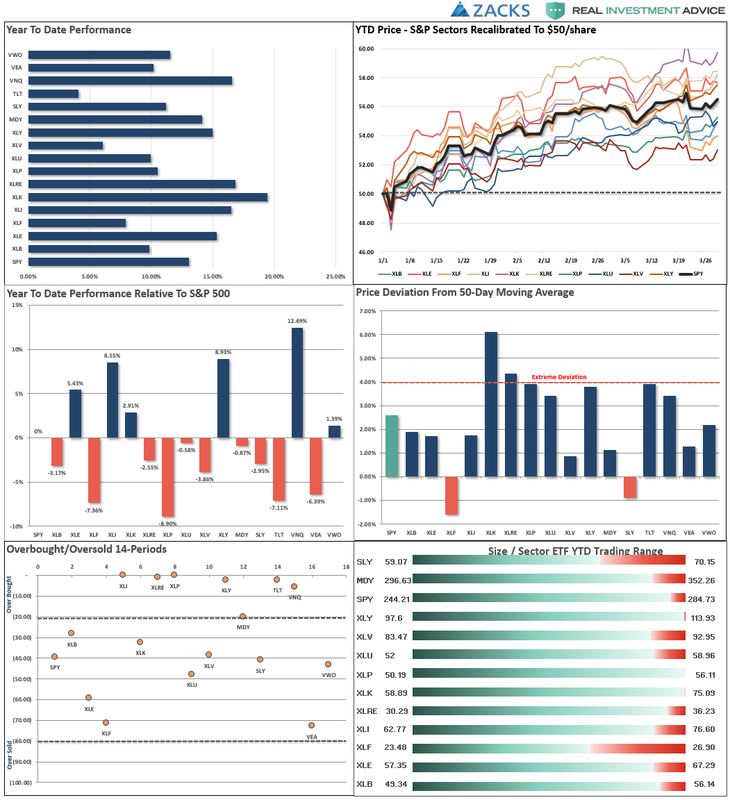 Take profits and reduce weightings on any rally next week until the backdrop begins to improve. As noted last week, Emerging Markets pulled back to its 200-dma after breaking above that resistance. We did add 1/2 position in EEM to portfolios three weeks ago understanding that in the short term, emerging markets were extremely overbought and likely to correct a bit. That corrective action is continuing and we need a breakout above the current consolidation to become more aggressive on the holding. Major International & Total International shares DID finally break above their respective 200-dmas on hope the worst of the global economic slowdown is now behind them. 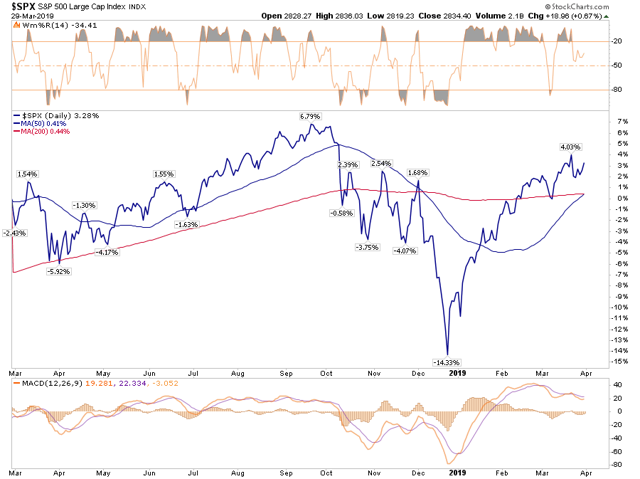 The pullback last week has brought the market back to test its 200-dma. It is critical that support holds next week. Keep stops tight on existing positions, but no rush here to add new exposure. Dividends, Market, and Equal Weight – These positions are our long-term “core” positions for the portfolio given that over the long term, markets do rise with respect to economic growth and inflation. 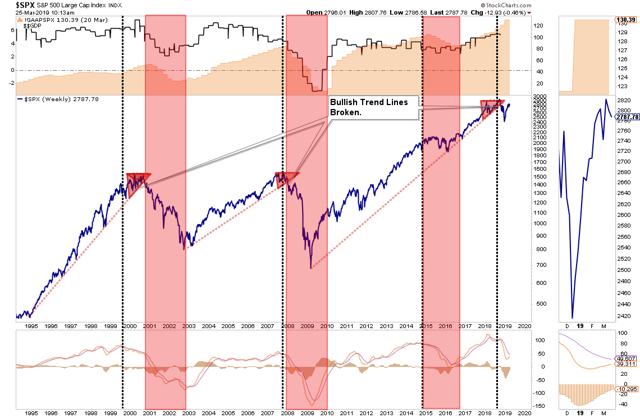 Currently, the short-term bullish trend is positive and our core positions are providing the “base” around which we overweight/underweight our allocations based on our outlook. Gold – Despite the reversal of the Fed, the collapse of the yield curve, and concerns about global economic growth, gold sold off last week and broke the rising trend of the 50-dma. Gold is oversold currently, but has really struggled to advance. 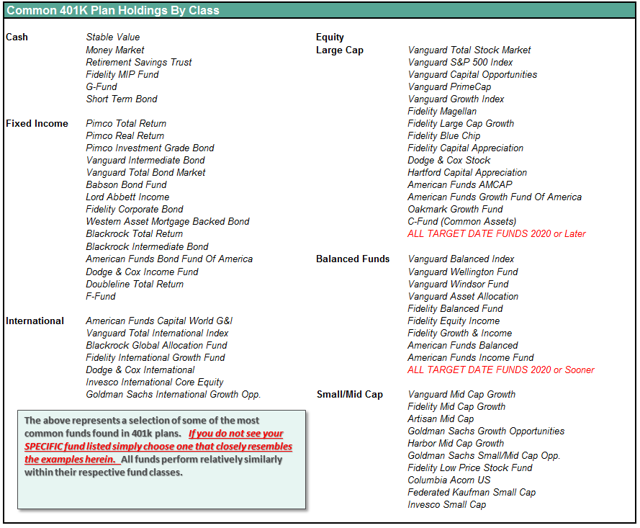 There isn’t a compelling reason to add more to our holdings at this juncture. A move above $125 will make things more interesting. The big move two weeks ago was in bonds. If you have been following our recommendations of adding bonds to portfolios over the last 13 months, this portion of the portfolio has performed well in offsetting market volatility. As noted previously, intermediate duration bonds remain on a buy signal after increasing exposure last month. However, they are now extremely overbought, so look for a pullback that holds 2.50% on the 10-year Treasury to increase exposure. High yield bonds, representative of the “risk on” chase for the markets, popped higher last week with the move higher in equities. International bonds, which are also high credit risk, are running akin to the markets. If you are long high yield or international bonds, take profits now and rebalance risk back to normal portfolio weights. The current levels are not sustainable and there will be a price decline which will offer a better entry opportunity soon. With rising concerns over economic weakness, the markets have consolidated over the last couple of weeks. With earnings season fast approaching, we are reviewing holdings to take profits, tighten up stops, and reduce risk. A bad announcement or forecast can have an immediate and sharp impact on company stocks prices. However, in most cases, we are carrying underweight exposure so we may get opportunities in some of our holdings to buy at cheaper prices as long as trends are holding. New clients: Will begin the onboarding process this coming week if the market continues to hold support at 2,800. 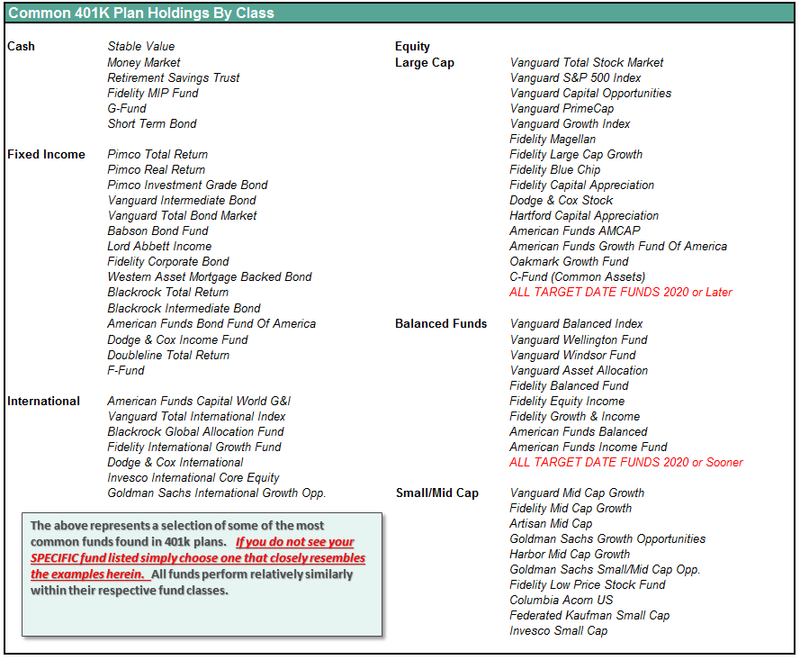 Equity Model: No changes – Reviewing for rebalancing as needed. As noted above, the bullish backdrop of the market remains currently, and the recent consolidation process has alleviated some of the short-term overbought condition. With earnings season getting ready to kick off, there is support for the markets over the next month. However, with that said, the economic risk is also rising as well, so we still want to remain cautious for the time being. That same advice remains this week.